Introduce yourself to others at Dhamma Wheel. my name is Andy but i go by "ushi" (japanese for "ox"; think Year of the Ox, strong as an ox, the Ten Ox-Herding Pictures, etc. the ox is a noble animal!). i am from western Colorado in the USA, right on the border between the mountains and the desert. i work in a public library and have been practicing Buddhism for around ten years, since i was in college. my initial training was in the vipassana style taught by S.N. Goenka, and i dove deeply into the intellectual side of buddhism, where i collected a large number of books and did very little in terms of actual practice. in the last year or so i have re-oriented myself to become a dedicated meditator. i now practice concentration meditation focusing on the breath and sit for between 30 and 60 minutes a day. in my rural community there are not many buddhists. i have been extremely fortunate to find a Rinzai zen sangha with a teacher here, so i sit with them regularly. my teacher is wonderful and supports me in continuing my concentration meditation and theravada practice even while sitting regularly with them. because of that, i also practice zazen (though i'm not sure zazen and concentration meditation have to be all that different... that might be another post for another time!) and am interested in mahayana buddhism as well. anyway, enough about me, i look forward to learning from your collective wisdom! thank you. Hi Ushi, and welcome to Dhamma Wheel! I hope you find the grazing here to your liking! Welcome! There are many similarities between Zen and Theravada. I like your tee shirt. I rather say "All (black) lives matter"
Hi SarathW! I respect your point and agree to the underlying assumption that all human lives are of equal worth, but choose (and made a conscious choice to represent myself on these forums with that picture) to highlight inequality in my home country (USA) in this very small way. 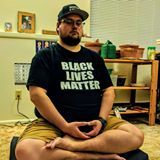 This might be a tangent, but my partner and I had a good discussion about my use of this picture to represent myself in some of the online Buddhist communities I participate in. I was slightly worried about appearing too political, or being seen as trying to start an argument, but I also wanted to represent this important aspect of daily struggle. I was also concerned about what is called in some social justice circles "performative allyship", which is a situation where one wears the shirts or posts the slogans/memes/quotes/what-have-you but doesn't live by the ideals that one might profess. My partner, wisely, asked how many people of color participate in these communities. I told her that I knew of very few, and she asked how I might feel if I was a person of color just beginning to participate in Buddhist communities, and saw someone with that shirt as their profile picture. I figured I might feel slightly buoyed by that, and so decided to go for it! Anyway, sorry for the extremely long response, but I felt it was important to explain. Anyway, thanks all for the welcome! I respect your opinion and I understand that you are trying your bit in a small way. I hope you enjoy the stay in DW. I was slightly worried about appearing too political, or being seen as trying to start an argument, but I also wanted to represent this important aspect of daily struggle. I was also concerned about what is called in some social justice circles "performative allyship", which is a situation where one wears the shirts or posts the slogans/memes/quotes/what-have-you but doesn't live by the ideals that one might profess. Dharma Wheel Engaged - Engaged Buddhism forum, a nonsectarian community discussing the application of the Dharma to social and environmental issues. As you rightly predicted, that which is political is bound to give rise to worldly arguments between two or more sides, who are each equally convinced that their own approaches and perspectives are the best means by which to alleviate dukkha more broadly, beyond the focus on the individual. We used to have a News, Current Events & Politics section here at Dhamma Wheel, to enable people to discuss such matters, but in recent times we assessed that, regrettably, the discussions were giving rise to more dukkha and discord than they were alleviating. Either way, once again, welcome! To attain the goal is to know and let go.